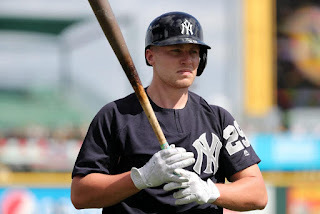 When the Yankees acquired Brandon Drury from the Diamondbacks in February, he was immediately handed the keys to the starting third base job for the Bombers. Drury came in with a proven Big League track record after hitting .275 while averaging 15 home runs and 58 RBI per year over the last two seasons in Arizona. He has proven to be a solid starting infielder at the Major League level, while logging time at both second and third base (the Yankees' two perceived weak spots coming into the year). The trade was also a sign that the Yankees clearly didn’t trust 23-year-old Miguel Andujar as their everyday third baseman just yet. Despite a strong showing in Spring Training, where he hit .267 with four home runs and 10 RBI, Andujar began the year with triple-A Scranton/Wilkes-Barre. However, Drury landed on the disabled list just eight games into the 2018 campaign. He had a recurrence of migraine headaches and associated vision problems that he said have been bothering him for years. Originally, the hope was that the issue would go away quickly and Drury would finally be able to move past this. Meanwhile, Andujar was suddenly thrust into the starting third base role. At first, it seemed likely that the young Dominican would be a stopgap that would split time with guys like Ronald Torreyes and Neil Walker, but after some early struggles in his first 10 games, Andujar quickly became a force in the Yankees lineup. Not only had he pushed those guys to the side, he was also building a case that the job belonged to him long term. On May 14, Drury was finally activated from the disabled list. However, he wasn’t headed back to New York like he expected. Instead, Drury was optioned to Scranton/Wilkes-Barre, where he has been ever since. Miguel Andujar had simply put a stranglehold on third base and the Yankees were left without much of a choice. The 25-year-old Drury had not spent time in the Minor Leagues, besides rehab appearances, since 2015. Considering the way he has played over the last two seasons, he probably thought he never would again. In a recent interview with the New York Post, Brandon Drury expressed his frustration with his current situation. It’s hard to argue with him considering he would start for most MLB teams. Moreover, Drury has done his job down in triple-A, hitting .313 with two home runs and 14 RBI in 112 at-bats. Furthermore, his OPS of .897 would rank second in the International League if he qualified. He also had a 32-game on-base streak before it was snapped on Tuesday. Drury, like Clint Frazier, Tommy Kahnle, and Ronald Torreyes, has had to spend more time in Scranton this year than he deserves. Despite that, Drury is no closer to New York than he was four weeks ago. This is because Miguel Andujar is the Yankees' hottest hitter right now. In his last 15 games, Andujar is hitting .385 with three home runs and 11 RBI. On the year, Andujar has a batting average of .310 and an OPS of .891 in 203 at-bats. He and Yankees second baseman Gleyber Torres appear to be the two front-runners for American League Rookie of the Year, and they aren’t going anywhere any time soon. This brings us to Brandon Drury’s best asset to the New York Yankees: his value on the trade market. While the Bombers are rich with infielders, they have a need for starting pitching. With Jordan Montgomery out for the season, and Masahiro Tanaka out for up to a month possibly, the Yankees are going to need to trade for a starting pitcher at some point. At 25-years-old, and with three more years of team control remaining, Drury is a player that makes sense for both contenders and rebuilding clubs. He could be a key piece in a package to acquire a starting pitcher. 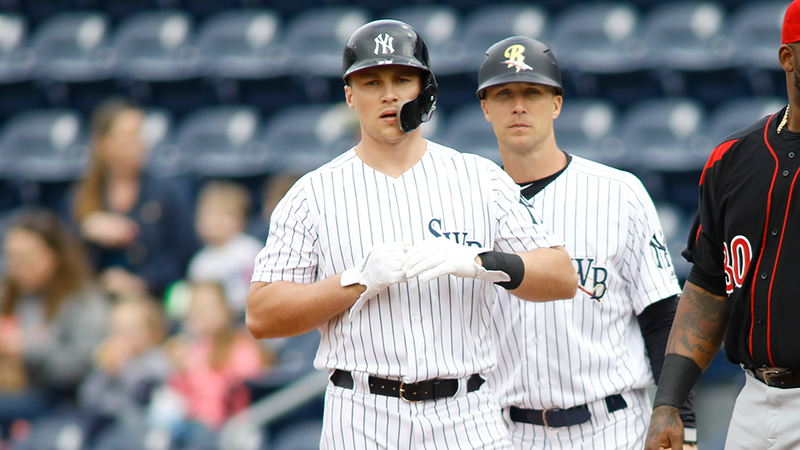 Barring injury, Brandon Drury has no role for the Yankees now or in the near future. He is a Major League-caliber infielder stuck in the International League. The best thing for him, and the Yankees, is for him to be traded to another team for a starting pitcher by the July 31 deadline. Wherever Drury lands, he is surely going to play motivated and hungry given what he has gone through this season. I don't like how he says he doesn't belong there. It's not the Yankees fault he was hurt or their fault Andujar took advantage of his opportunity. If he was up and doing poor but Andujar was in minors doing well would he trade places with him? I doubt it. He does make a good trade asset and pitching should definitely be the target. I see a possible trade to Toronto for JA Happ, particularly if Toronto trades Donaldson. Then Drury takes over 3B, Yankees get Happ, and Toronto gets additional pieces for Donaldson. Win-Win as far as I see it. Drury could certainly work in Happ trade considering he plays second base and Devon Travis hasn’t been the same the last two years. Drury would also make sense in Texas with Adrian Beltre’s expiring contract and Rougned Odor struggling for the second straight season.